Pour marinade ingredients directly into freezer bag and mix well. Add beef and massage in marinade until well covered. Refrigerate for 2-8 hours. 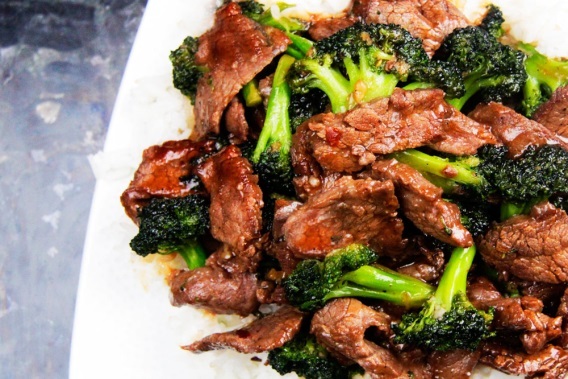 When ready to make Beef and Broccoli, whisk the sauce ingredients together in a small bowl. In another small bowl, combine garlic, ginger, red pepper flakes and 1 teaspoon peanut oil. Set aside. Drain excess marinade off of beef (if there is any). Heat 1 1/2 teaspoons peanut oil in a large nonstick skillet over high heat until very hot and sizzling. Add beef to the skillet and break up any clumps; cook without stirring for 1 minute, then stir and cook until beef is browned and almost cooked through, about 1-2 minutes (it will cook more in the sauce). Don’t overcook or it won’t be as tender! Transfer beef to a large plate and cover. *If your skillet is small, then cook in 2 batches. Add 1 tablespoon peanut oil to the now-empty skillet; heat until very hot and sizzling. Add the broccoli and sauté for 30 seconds. Add water, cover pan, and lower heat to medium. Steam broccoli until crisp-tender, about 2 minutes.Push the broccoli to the sides of the skillet and add the garlic/ginger/red pepper/oil to the center of the pan, mashing the mixture with a spoon, until fragrant, about 15 to 20 seconds, then stir the mixture into the broccoli. Return the beef to the skillet and toss to combine. Whisk the sauce to recombine then add to the skillet. Cook, stirring constantly, until the sauce is thickened and beef is cooked through, about 1-2 minutes. Transfer to a serving platter, sprinkle with the scallions, and serve. Hoisin Sauce is a Chinese Barbecue sauce and can be found in all supermarkets in the Asian aisle (alongside the oyster sauce). This recipe only calls for it in the marinade, so it is not essential, but definitely good to have in the pantry! Marinate chicken in soy sauce, wine, sesame oil and sugar for about an hour. Mix flour and cornstarch and place in a large Ziploc bag. Drain chicken and add to flour mixture. Shake gently to coat. Fry in hot oil (350°) until golden brown. Drain on paper towels.To make sauce, mix chili sauce, ketchup, honey, oyster sauce, soy, sauce and water in a medium sauce pan. Bring to a boil then simmer until sauce begins to thicken. 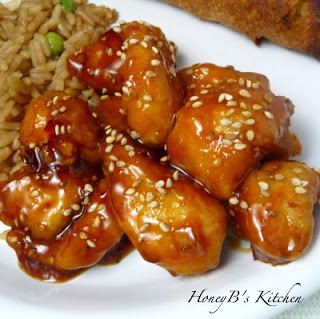 Toss sauce with chicken pieces, sprinkle with sesame seeds and serve. 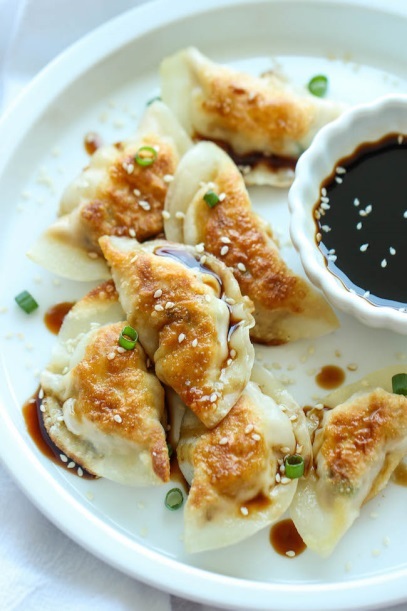 Pot stickers are unbelievably easy to make. Best of all, they're freezer-friendly, perfect for those busy weeknights! Heat vegetable oil in a large skillet over medium heat. Add pot stickers in a single layer and cook until golden and crisp, about 2-3 minutes per side. Serve immediately with soy sauce, if desired. *The filling in the pot stickers does not have to be cooked prior to wrapping. *To freeze, place uncooked pot stickers in a single layer on a baking sheet overnight. Transfer to freezer bags.